Halloween is just a few weeks away. I am going to pick up a few pumpkins tonight for carving, but I don’t think my carving, or engineering skills match this guy’s skill. 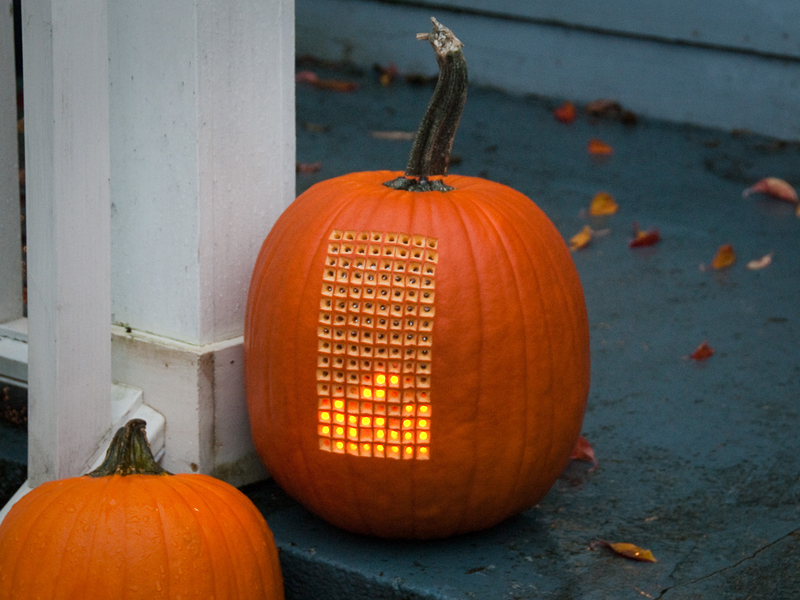 The pumpkin in this image includes a fully playable version of Tetris. The unique pumpkin was created last year and post on the website Hahabird. I had a LOLShield I hadn’t assembled yet, and I knew that someone had already written Tetris for it, so I figured it would be a simple matter to poke some holes in the pumpkin to match the LEDs, make a controller, and be done. But oh no, that would be too simple, and would look kind of lame. Little tiny LEDs, all stuck together on a 2×3″ area? Nahhhh. Plan B: Still use the LOLshield, but instead of mounting LEDs in the shield I would wire them up externally so I could space them out more on the pumpkin. Luckily, I didn’t get too far down that route before I realized that the bundle of wires between the LEDs and the shield would be as thick as my wrist and a nightmare to solder and organize. I was going to have to make my own LED matrix and program my own Tetris. With the decision made, I ordered 140 amber LEDs from Mouser and a pair of LED Matrix I2C “backpacks” from Adafruit. These little circuits come with a mini (.8″ square) LED matrix that I could use for programming instead of having to wire up my own LED matrix right from the start..